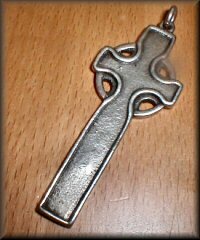 This is a very unusual little Iona St Martin's cross, only 1" high. Possibly a ladies devotional cross. This is pre-Alexander Ritchie and is hallmarked Birmingham 1896, with a maker's mark RDS. Possibly an early Darby and Sons piece? (RD&S?). 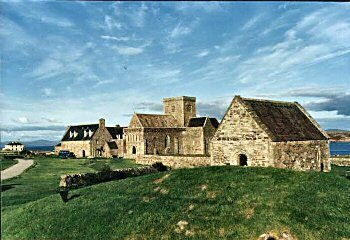 An indication that a few specific mementos of the Isle of Iona were already being produced in silver during the Victorian era. 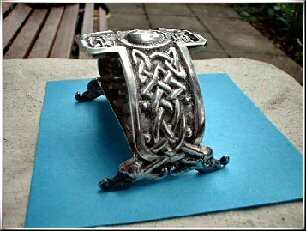 One silver jeweller who was working in the Celtic style at the same time as the Ritchies, although he in fact began well before them, was John McGilvray. McGilvray sold his work from his shop in Oban, on Scotland's west coast. Having links with Iona, his work is sometimes marked with the island's name, and also his maker's mark of J McG. On some elaborate pieces the letters JMG are used, with the G positioned below and not alongside the JM. 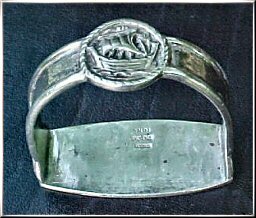 Shown here is a fine semicircular napkin ring hallmarked for Glasgow 1920. It has four feet in the form of bird's heads, with knotwork rising up the sides to a central 'sun-boss', which has two projections above and below it, each containing a small panel of knotwork. The maker's mark is JMG. 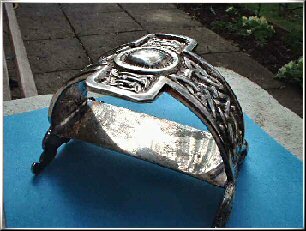 Silver brooch by John McGilvray. The border resembles early Ritchie scrolled vine patterning, and reverse is hallmarked for Glasgow 1923. Also marked McG & S and IONA. 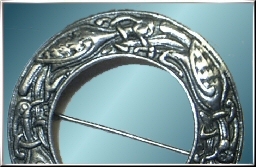 Silver semicircular napkin ring by John McGilvray, depicting a Viking ship. 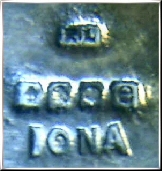 Marks are IONA, J McG&S, and Glasgow hallmark for 1924. 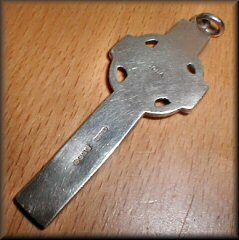 Plain silver Celtic cross, Glasgow hallmarks for 1923 and "IONA" on the reverse. Makers Mark JMcG&S. 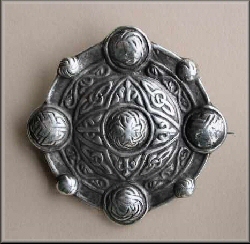 Silver shield brooch, diameter 4.5cms, by John McGilvray. Hallmarks for Glasgow 1923 and stamped IONA. Photos kindly supplied by Robert Abel. 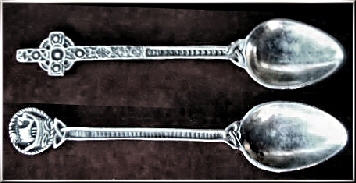 Two silver spoons using themes very much associated with Alexander Ritchie. These were made along with many other Celtic silver jewellery items which adapted and/or modified Ritchie's original designs, by the Birmingham silver company S & Co in the 1940s. The hallmarks are for Chester and 1945 on both spoons. One has a typical Iona Viking ship design on the handle - the other has a double-sided St Martin's Cross.